If the shower enclosures in your Cincinnati, Ohio, home are looking a little worse for the wear, the team at 31-W Insulation is here to assist. Not only can older glass shower enclosures that are cracked, chipped, or warped detract from the appearance of your bathroom, but they can also pose a safety risk. For this reason, it’s important to make sure that your shower enclosure is in good working order, and the company that homeowners in the Cincinnati area continue to trust is 31-W Insulation. Here at 31-W, we install shower enclosures made by Quality Enclosures and Coastal Industries, two of the most well-known and trusted manufacturers of high-quality glass shower products in the business. With many different styles to choose from, including fixed, hinged, and sliding, you will be able to choose a shower enclosure that complements your bathroom perfectly. 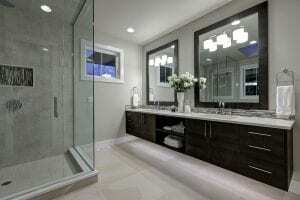 Furthermore, with different aesthetic styles to choose from, including framed, frameless, and semi-frameless, and a bevy of decorative glass and hardware options, you can design a shower enclosure that meets your every need! And, because we rely exclusively on our team of company-employed technicians to complete installation, you can be sure that your new shower enclosures are installed flawlessly the first time. By never using subcontractors, we are able to ensure a loftier standard of workmanship than many of our competitors, and that’s just one of the many reasons why 31-Insulations stands head and shoulders above other home improvement companies in the area. To learn more about the glass shower enclosures that we install for homeowners in Cincinnati and surrounding areas, contact 31-W Insulation today. We would be happy to answer any questions you have.